Malik, Arun. “Pollution or Crime? The Effect of Driving Restrictions on Criminal Activity” , Forthcoming, Journal of Public Economics. Moore, Michael. “Do Trade Rules Trump Climate Commitments: Indian Solar Panel Dispute”, Forthcoming, World Trade Review. Chen, Maggie X. with Cathy Ge Bao, “Foreign Rivals are Coming to Town: Responding to the Threat of Foreign Multinational Entry,”American Economic Journal: Applied Economics, Vol 10(4), 120-157, 2018. See the Online Appendix here. Chen, Maggie X. with Laura Alfaro, “Selection and Market Reallocation: Productivity Gains from Multinational Production,” American Economic Journal: Economic Policy, Vol 10(2), Lead Article 1-38, 2018. Smith, Stephen C. with Yao Pan and Munshi Sulaiman, “Agricultural Extension and Technology Adoption for Food Security: Evidence from Uganda,” American Journal of Agricultural Economics, Vol. 100(4), 1012-1031, July 2018. Read the policy brief here. Read the U.S. Government’s post highlighting their work here. 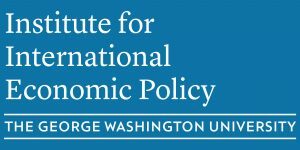 Williams, Tomas, “International asset allocations and capital flows: The benchmark effect,” Journal of International Economics, September 2017. Uriyoan Colon-Ramos,“How Self-Objectification Impacts Physical Activity Among Adolescent Girls in Costa Rica”, J Phys Act Health, vol. 14(2), Feb 2017. Uriyoan Colon-Ramos,“Formative Research to Design a Promotional Campaign to Increase Drinking Water amog Central American Latino Youth in an Urban Area”, J Health Commun, Vol. 22(6), Jun 2017. Uriyoan Colon-Ramos,“How Latina mothers navigate a ‘food swamp’ to feed their children: a photovoice approach”, Public Health Nutrition, Vol. 20(11), Aug 2017. Uriyoan Colon-Ramos,“Progress towards elimination of trans-fatty acids in foods commonly consumed in four Latin American cities”, Public Health Nutri, Vol. 20(13), Sep 2017. Uriyoan Colon-Ramos,“Transnational Mortality Comparisons Between Archipelago and Mainland Puerto Ricans”, J Immigr Minor Health, Vol. 19(5), Oct 2017. Kramon, Eric, “Electoral Handouts as Information,”World Politics, May 2016. Aaronson, Susan, “The Digital Trade Imbalance and Its Implications for Internet Governance,”Global Commission on Internet Governance, February 2016. Charnovitz, Steve, “An Appraisal of the Labor Chapter of the Trans-Pacific Partnership,”Committee on Ways and Means Democrats, January 2016. Smith, Stephen C. with Verena Dill and Uwe Jirjahn, “Do Foreign Owners Favor Short-Term Profit? Evidence from Germany,”Cambridge Journal of Economics, 40, 123–140, January 2016. Uriyoan Colon-Ramos,“Household food insecurity as a determinant of overweight and obesity among low-income HIspanic subgroups: Data from the 2011-2012 California Health Interview Survey”, Appetite, Vol. 97, Feb 2016. Uriyoan Colon-Ramos,“Association between dietary patterns during pregnancy and birth size measures in a diverse population in Southern US”, Nutrients, Vol .7(2), February 2015. Uriyoan Colon-Ramos,“The influence of gender stereotypes on eating habits among Costa Rican adolescents”,AM J Health Promot, 29(5), May-Jun 2015. Uriyoan Colon-Ramos,“Moving Toward Universal Health Coverage (UHC) to Achieve Inclusive and Sustainable Health Development: Three Essential Strategies Drawn From Asian Experience Comment on “Improving the World’s Health Through the Post-2015 Development Agenda: Perspectives from Rwanda”, Int J Health Policy Manag, Vol. 4(12), August 2015. Huang, Cheng. “Ambient air pollution and adverse birth outcomes: a natural experiment study” , Population Health Metrics , Vol. 13, 2015. Smith, Stephen C. with M. Shahe Emran and Fenohasina Maret-Rakotondrazaka, “Education and Freedom of Choice: Evidence from Arranged Marriages in Vietnam,”Journal of Development Studies, Vol 50, No. 4, 481-501, April 2014. Sinclair, Tara and Julia Bersch, “Statistical versus economic output gap measures: evidence from Mongolia,” Economics Bulletin, Vol 34, No. 3, pages 1864-1874, 2014. Uriyoan Colon-Ramos, “The association between fruit and vegetable intake, knowledge of the recommendations and health information seeking within adults in the U.S. mainland and in Puerto Rico”, Journal of Health Communication, Vol. 20(10), 2014. Uriyoan Colon-Ramos, “Rising Overweight-Obesity and Its Socio-Demographic Correlates in Addis Ababa, Ethiopia 2010-2011“, BMC Public Health, 2014. Fostel, Ana with John Geanakopolos, “Tranching, CDS and Asset Prices: How Financial Innovation can Cause Bubbles and Crashes,” forthcoming in American Economic Journal: Macroeconomics, 2012, 4(1): 190-225. Sinclair, Tara, Edward N. Gamber, H.O. Stekler and Elizabeth Reid. “Jointly Evaluating the Federal Reserve’s Forecasts of GDP Growth and Inflation,”International Journal of Forecasting, Volume 28, Issue 2, April– June 2012, Pages 309–314. Sinclair, Tara with Sinchan Mitra, “Output Fluctuations in the G-7: An Unobserved Components Approach,” Macroeconomic Dynamics, Volume 16, Issue 03, pp. 396-422. June 2012. Chen, Maggie Xiaoyang. “Interdependence in multinational production networks,”Canadian Journal of Economics Vol. 44 No. 3, pp. 930-956. 2011. Fostel, Ana with Luis Catao, and Romain Ranciere, “Fiscal Discoveries, Stops and Defaults,” Paris School of Economics, 2011. Fostel, Ana with John Geanakoplos, “Why does bad news increase volatility and decrease leverage?” Journal of Economic Theory, 2011. Joutz, Fred with C.D. Wei, “Inflation Illusion or No Illusion: What Did Pre- and Post-War Data Say?” Applied Financial Economics, Vol. 21, pp. 1599-1603. 2011. Moore, Michael O., with Maurizio Zanardi, “Trade Liberalization and Antidumping: Is There a Substitution Effect?,” Review of Development Economics Vol. 15 No. 4, pp. 601-619. 2011. Pelzman, Joseph. and Amir Shoham. “What’s New in Our World? Thinking about the Great Recession,” editor Special Edition. Global Economy Journal, May 2011. Chao Wei, with Santoro, Marika, and “Taxation, Investment And Asset Pricing,”Review Of Economic Dynamics, Vol. 14 No. 3, pp. 443-454. 2011. Fostel, Ana with John Geanakoplos, “Collateral Restrictions and Liquidity Under Supply: A Simple Model,” Economic Theory. Fostel, Ana with Graciela Kaminsky, “Latin America’s Access to International Capital Markets: Good Behavior or Global Liquidity?” in Kevin Cowan, Sebastian Edwards, and Rodrigo Valdes (eds) Current Account and External Financing, Central Bank of Chile. James E. Foster with Kathryn H. Anderson and David E. Frisvol, “Investing In Health: The Long-Term Impact Of Head Start On Smoking,” Economic Inquiry Vol. 48 No. 3, pp. 587-602. 2010. Chen, Maggie Xiaoyang, and Sumit Joshi, “Third-Country Effects On The Formation Of Free Trade Agreements,” Journal Of International Economics Vol. 82 No. 2, pp. 238-248. 2010. Joutz, Frederick L., “Interview With Herman O. Stekler,” International Journal Of Forecasting Vol. 26 No. 1, pp. 195-203. 2010. Fred Joutz with Poonpat Leesombatpiboon, “Sectoral demand for petroleum in Thailand,” Energy Economics Vol. 32 No. 1, pp. S15-S25. 2010. Sinclair, Tara M. and Fred Joutz, with H. O. Stekler. “Can The Fed Predict The State Of The Economy?,” Economics Letters Vol. 108 No. 1, pp. 28-32. 2010. Sinclair, Tara M., with H. O. Stekler, and L. Kitzinger, “Directional Forecasts Of GDP And Inflation: A Joint Evaluation With An Application To Federal Reserve Predictions,”Applied Economics Vol. 42 No. 16-18, pp. 2289-97. 2010. Wei, Chao, “Inflation And Stock Prices: No Illusion,” Journal Of Money, Credit, And Banking Vol. 42 No. 2-3, pp. 325-345. 2010. Sinclair, Tara, “Asymmetry in the Business Cycle: Friedman’s Plucking Model with Correlated Innovations,” Studies in Nonlinear Dynamics & Econometrics, Vol. 14, No. 1 (2010), pp. 520-542. Ana Fostel, with Luis Catao and Sandeep Kapur, “Persistent Gaps And Default Traps,” Journal Of Development Economics Vol. 89 No. 2, pp. 271-284. 2009. Fred Joutz and Angela Poulakidas, “Exploring the link between oil prices and tanker rates,” Maritime Policy & Management Vol. 36 No. 3, pp.215-233. 2009. Wei, Chao, “Does The Stock Market React To Unexpected Inflation Differently Across The Business Cycle?,” Applied Financial Economics Vol. 19 No. 22-24, pp. 1947-59. 2009. Wei, Chao, “A Quartet Of Asset Pricing Models In Nominal And Real Economies,”Journal Of Economic Dynamics And Control Vol. 33 No. 1, pp. 154-165. 2009. Sinclair, Tara, with H.O. Stekler, “Forecast evaluation of AveAve forecasts in the global VAR context,” International Journal of Forecasting, Vol. 25, No. 4, pp. 693-696, October – December 2009. Sinclair, Tara, “The Relationships between Permanent and Transitory Movements in U.S. Output and the Unemployment Rate,” Journal of Money, Credit, and Banking, Vol. 41, No. 2-3 (March-April 2009), pp. 520-542.